Only 10% of adults have a consistent work-out plan. When you’re stuck behind your desk all day while you work, a lot of the time you lose track of your health. Your physique becomes flabby, your mentality becomes listless, and you pretty much evolve into a completely out of shape slab of skin. It can be hell on your self-confidence. The TrekDesk offers an all-in-one solution for the home worker. It keeps you moving and your heart a-pumpin’ as you tap away at your keyboard answering e-mails. All you have to do is attach the easily assembled 70 x 38 desk onto any standard treadmill. 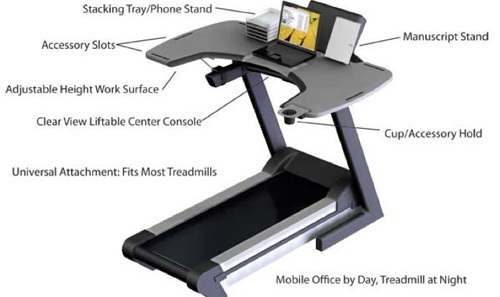 It’s universal design ensures that your existing treadmill is compatible with the TrekDesk. So while you might not be able to get out as much as you used too, that is no longer an excuse to let your health suffer as a consequence. Even if your skin becomes translucent from the lack of sun, you’ll be able to maintain a healthy heart and body instead of becoming one of those people who let themselves go, after working from home for a few short months. I have to ask, how do you avoid sweating on your papers and things? I guess it must be designed around a Low impact setting on the treadmill. Still, low burn is better than no burn. Great article/gadget, probably. It is such a shame I had to fight the drop-down classmates.com ad that was obscuring most of it. I didn’t bother reading the rest and will not be back until I forget the incident. You really won’t sweat guys. Not at 1 mph. I use a home made treadmill desk but I have to admit I love the design of this TrekDesk, especially the chair for those moments when I would rather sit. You will lose weight and feel energized. I read a lot of articles on their site at http://www.trekdesk.com. What I did not realize is that slow, sustained movement like walking has a significant impact on our health. You should read the studies and see for yourself.